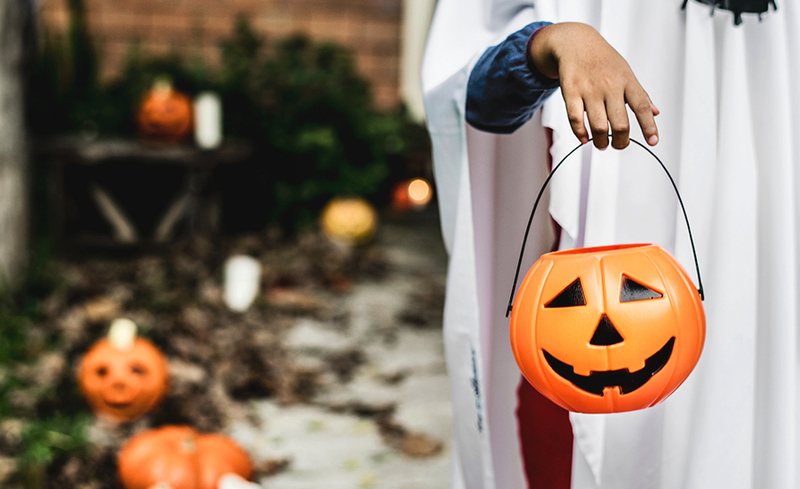 With Halloween just around the corner, ramp up your social media campaigns with these four social strategies. Before you know it, stores will be stocked with spooky decorations, collections of creepy costumes and candy displays on every end cap. That means, if you haven’t already, you should be devising and executing a strategy for your Halloween social media campaigns. While a short-lived holiday, Halloween brings in billions of dollars each year. Last year, spending in the U.S. reached a record $9.1 billion (compared to $8.4 billion in 2016). The big selling points: costumes, decorations and of course, candy. Halloween is a big deal, but it can present some challenges for brands (especially those that don’t see how it ties into their business objectives). Around the time of Halloween, marketers have the flexibility to get creative and really stand out. To make the most of your advertising budget, here’s our advice on launching spellbinding Halloween social media campaigns. As with all holidays, time is of the essence. To be successful, you’ll need to plan ahead to consider the optimal time to push your campaigns, which devices to target and which social channels to direct your budget. With that in mind, we’ve pulled some of last year’s data to help you get a headstart. Sixty-four percent of celebrants won’t typically begin Halloween shopping until October compared to over one-third who begin earlier. The most shopping occurs in the first two weeks of October. Men are more likely to put off their Halloween shopping until the last two weeks of October. Timing will vary by industry and target audience, but it’s best to have your campaigns started in September, slowly ramping up your ads as Halloween approaches. The biggest push should fall in those first two weeks of October. Where you choose to launch your Halloween social media campaigns will depend largely on your target audience. But if you’re in the retail, craft or food industries, you’ll want to turbocharge your Pinterest advertising strategy. Pinterest is a haven for DIYers and crafters alike to find their Halloween inspiration. Pinners are also most likely to pin and shop at the same time, searching for inspiration as they scour the craft aisle or makeup department. In other words, zero in on mobile users. 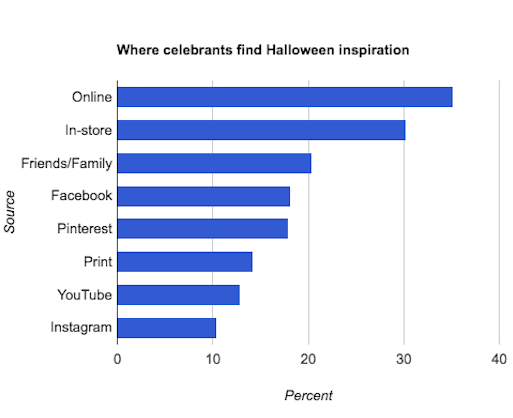 While you’ll be wise to focus on Pinterest, Facebook also sees a lot of traffic during Halloween. It’s also worth noting that Instagram has seen an upward trend throughout the years for Halloween inspiration. Halloween is a brand’s best friend simply because creatives can be as friendly or as spooky as you want. Think of all the Halloween campaigns that have stuck with you. Were they fun and sweet, or thrilling and eye-catching? The post incorporates a looping video to draw the user in — and a zombie hand reaching out to offer a tasty beverage. This ad does more than pull the user in, it leaves them wanting more. Halloween presents an endless opportunity for exciting creatives that boost awareness and ad recall. The goal here is to create scroll-stopping creatives, whether they’re fun, exciting or thrilling. Halloween is a time to make a big brand impact. Like Starbucks, incorporate quick videos that wow your audience and help them remember your brand or offer. If there’s one thing you should do, it’s to make informed decisions based on previous data, keeping in mind the latest social media trends. Take a look at last year’s performance. Did your campaigns on YouTube outperform those on Facebook? Do you need to change up your creative tactics and explore new strategies? Looking at last year’s Halloween marketing efforts is a good place to start and you can even compare it to the year prior. This will give you a good indication of how your ads have performed and if there are areas to improve upon. So there you have it! Four tricks to devise a wickedly effective strategy for your Halloween social media campaign. Take these insights and explore new ways that you can captivate (or even surprise) your audience for the greatest impact.